The term 'nominal fire door' is used where an existing fire door's fire separation performance cannot be proven but it is assumed that the door will be of a suitable build to act as a fire door. Fire safety legislation is a good place to begin with before moving on to identification marks found on fire doors and other evidence such as assessment reports. Finally, we will look at the validity of a nominal fire door versus a fire door that can be identified with evidence of performance. It is illegal to place a fire door on the market without it having suitable evidence of performance so when purchasing fire doors one should ask the manufacturer, supplier or installer to provide such evidence. Building Regulations Approved Document B contains an appendix covering fire doors and states performance requirements giving reference to British and European Standards. So where the building is new or undergoing a change of use the fire doors should conform to BS 476-22:1987 or BS EN1634-1:2014 and the local authority building inspector may request evidence of compliance. In existing buildings the Regulatory Reform (Fire safety) Order 2005 applies and compliance is mandatory. The Order applies to all properties except inside people's private homes. It covers public buildings, places of employment, entertainment and leisure as well as the common areas of buildings that contain separate flats. This includes each individual flat entrance door from the common areas. Article 17 of the Order places an obligation on the "Responsible Person" to ensure fire doors are "subject to a suitable system of maintenance and are maintained in an efficient state, in efficient working order and in good repair". Given that the employer, building operator, building owner or possibly his agent has a legal duty to maintain fire doors in efficient working order, periodic inspection will be necessary and this includes identifying the suitability of a door as a fire door. Door manufacturers vary in the way they mark their products. First we will look at fire doors that are certificated under a third party certification scheme. Operators of such schemes are known as certification bodies and are assessed by the United Kingdom Accreditation Services (UKAS). 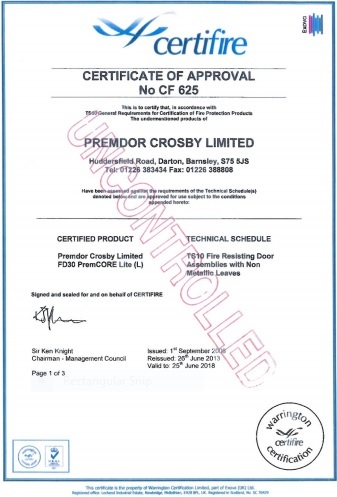 Third party certification schemes for fire doors are provided by BWF-Certifire, Exova BM TRADA Q Mark, International Fire Consultants and Loss Prevention Certification Board (LPCB). Fire door manufacturers belonging to such schemes mark their doors with a label usually found on the door top edge or with plastic plugs on the hanging edge. By locating the label or plug it is possible to identify the door's particular scheme and its fire rating and manufacturer's details. Such a label or plug confirms that the door is a third-party-certificated fire door and provided that it has been installed and maintained in accordance with the manufacturer's instructions it should provide the fire protection level indicated. There may be other labels or marks (the name of the manufacturer or product reference for example) found on a fire door but these may not necessarily refer to a third party certification scheme in which case one should refer to the manufacturer for evidence of performance. Sometimes fire doors are supplied without any mark, label or plug but there may still exist evidence of fire performance. An example of such a fire door is one made at a joinery company using a fire door blank or fire door core that has test or assessment evidence. The joinery company must work within the scope of the door blank or door core manufacturer's instructions and then provide evidence of fire performance accordingly. What if no identification can be found? However, identifying fire doors is not always straight forward because quite often the installer has planed-off the label or painted over the label or plug. A competent installer would always ensure that labels and plugs are retained for the purposes of identification and inspection in the future. Until such time as the industry wins the battle in educating installers that a fire door is first and foremost a fire safety device this is something that will keep on happening. So, when identifying fire doors it is best to start with any documentary evidence contained in log books and manuals where these can be physically cross-referenced with actual doors at the building. In many cases, especially with older buildings, there will be no such manual and it will be necessary to inspect the door for identification marks and it should be borne in mind that fire separation performance of any door, certificated or otherwise, will be affected by the quality of its original installation and any maintenance works carried out since. Or indeed lack of maintenance works! Where there appear to be no identification marks on fire doors this may be, as stated above, because they have been removed by the installer or covered by paint but it could also be that the door is not certificated and because no documentary evidence of performance exists it can only be at best a Nominal fire door. Remember at the top of the article we said that a Nominal fire door is one where there exists no evidence of fire separation performance. That doesn't mean that it may not provide sufficient fire protection but in order to assess its likely performance careful inspection by a competent person is necessary. Solid Timber is an excellent material for making fire doors because, when subject to fire, it forms a surface char and burns (in the case of most species) at a predictable rate according to density. So, if the door construction is of solid hardwood of at least 44mm thickness, has no voids in its core, no apertures cut-out and has been correctly installed and maintained, it is likely, depending on its construction, that it provides a level of fire separation performance comparable to a similar fire door that does have evidence of performance. However, a fire door is not just a timber door leaf but a combination of various components such as door leaf, door frame, hinges, self-closer, fire and smoke seals and possibly a lock or latch. It may have a glazed vision panel or other type of aperture cut-out and even with the knowledge of charring rates for different timber species it may be difficult to reach a decision on a door's suitability without expert help. For some, reaching a decision whether a door can be accepted as nominal fire door may be as simple as checking that the door seems heavy, solid and has no apparent defects but is that enough? The way to think of a nominal fire door is as 'an unknown' in relation to performance and making reliable judgements may not be easy. In order to remove some of the unknowns and evaluate the doors' suitability a thorough inspection will be necessary and this may include removing the door from its frame to make some of the checks detailed below. Density and construction of core material is very important as is the condition of the door at its edges. Edges should be lipped with hardwood and should have the correct intumescent door seals (and smoke seals where cold smoke protection is required) fitted at the top edge and both vertical edges and, of course, the door must close completely to rest against the rebate stop of the door frame. The fire door closer device must close the door completely overcoming any resistance from edge seals and the latch bolt or strike. Fire performance of a timber door will depend on the door remaining stable and resistant to deflection. If the door suffers heavy burning at the hinges or at the latch keep then the screws that retain the hardware will fail and the door will partially open allowing spread of flames to the non-fire side. Screw fixings must be fit for purpose and the types, sizes and number that may be used for a regular door may not be acceptable for a fire door. Core material for timber fire doors may vary between 450 kilograms per cubic metre for softwood to around 620 to 700 kilograms per cubic metre for hardwood and composite materials such as chipboard and MDF but density is only part of the story. The sectional dimensions of stiles and rails will greatly influence the fire performance of the door, too. The addition of glazed panels, letter-plates, spy viewers and air transfer grilles as well as voids within the core of the door construction will all contribute to failure. Door hardware such as hinges, self-closers and locks is a specialist subject and use of the wrong types will also lead to premature failure. It will also be necessary to seal the gap between the door frame and supporting wall. There is very little guidance available about nominal fire doors but the documents: British Standard BS 8214:2016 'Timber-based fire doors Code of practice' and the Guild of Architectural Ironmongers and Door Hardware Federation joint publication titled 'Hardware for fire and escape doors' will be useful in helping to check nominal fire doors for suitability. With the above information in mind it is clear that nominal fire doors should be risk-assessed. The best course of action may be to decide to keep them only in non-critical locations and replace them with new fire doors for protection of escape routes, for example. There are qualified fire door inspectors that are able to assist in the inspection of nominal fire doors and advise according to their findings. As with making any decision that potentially affects life safety careful consideration should be given to all available options.